Some of the configuration properties found in Hadoop have a direct effect on clients, such as HBase. One of those properties is called "dfs.datanode.max.xcievers", and belongs to the HDFS subproject. It defines the number of server side threads and - to some extent - sockets used for data connections. Setting this number too low can cause problems as you grow or increase utilization of your cluster. This post will help you to understand what happens between the client and server, and how to determine a reasonable number for this property. 2008-11-11 19:55:58,455 WARN org.apache.hadoop.dfs.DFSClient: DataStreamer Exception: java.io.IOException: Unable to create new block. This should help with the above problem, but you still might want to know more about how this all plays together, and what HBase is doing with these resources. We will discuss this in the remainder of this post. But before we do, we need to be clear about why you cannot simply set this number very high, say 64K and be done with it. There is a reason for an upper boundary, and it is twofold: first, threads need their own stack, which means they occupy memory. For current servers this means 1MB per thread by default. In other words, if you use up all the 4096 DataXceiver threads, you need around 4GB of heap to accommodate them. This cuts into the space you have assigned for memstores and block caches, as well as all the other moving parts of the JVM. In a worst case scenario, you might run into an OutOfMemoryException, and the RegionServer process is toast. You want to set this property to a reasonably high number, but not too high either. Second, having these many threads active you will also see your CPU becoming increasingly loaded. There will be many context switches happening to handle all the concurrent work, which takes away resources for the real work. As with the concerns about memory, you want the number of threads not grow boundlessly, but provide a reasonable upper boundary - and that is what "dfs.datanode.max.xcievers" is for. From the client side, the HDFS library is providing the abstraction called Path. This class represents a file in a file system supported by Hadoop, represented by the FileSystem class. There are a few concrete implementations of the abstract FileSystem class, one of which is the DistributedFileSytem, representing HDFS. This class in turn wraps the actual DFSClient class that handles all interactions with the remote servers, i.e. the NameNode and the many DataNodes. + " exceeds the limit of concurrent xcievers "
LOG.debug(datanode.dnRegistration + ":Number of active connections is: "
and monitor during a start of HBase what is logged on the DataNode. For simplicity's sake this is done on a pseudo distributed setup with a single DataNode and RegionServer instance. The following shows the top of the RegionServer's status page. 12/03/05 13:01:41 INFO regionserver.HRegionServer: Received request to open region: usertable,user1240813553,1330944811370.12c95922805e2cb5274396a723a94fa8. 12/03/05 13:01:41 INFO regionserver.HRegionServer: Received request to open region: usertable,user1361265841,1330944811370.80663fcf291e3ce00080599964f406ba. 12/03/05 13:01:41 INFO regionserver.HRegionServer: Received request to open region: usertable,user1481880893,1330944827566.fb3cc692757825e24295042fd42ff07c. 12/03/05 13:01:41 INFO regionserver.HRegionServer: Received request to open region: usertable,user1602709751,1330944827566.dbd84a9c2a2e450799b10e7408e3e12e. 12/03/05 13:01:41 INFO regionserver.HRegionServer: Received request to open region: usertable,user1723694337,1330944838296.cb9e191f0d8c0d8b64c192a52e35a6f0. 12/03/05 13:01:41 INFO regionserver.HRegionServer: Received request to open region: usertable,user1844378668,1330944838296.577cc1efe165859be1341a9e1c566b12. 12/03/05 13:01:41 INFO regionserver.HRegionServer: Received request to open region: usertable,user1964968041,1330944848231.dd89596e9129e1caa7e07f8a491c9734. 12/03/05 13:01:41 INFO regionserver.HRegionServer: Received request to open region: usertable,user2084845901,1330944848231.24413155fef16ebb00213b8072bc266b. 12/03/05 13:01:41 INFO regionserver.HRegionServer: Received request to open region: usertable,user273134820,1330944848768.86d2a0254822edc967c0f27fe53e7734. 12/03/05 13:01:41 INFO regionserver.HRegionServer: Received request to open region: usertable,user394249140,1330944848768.df37ded27f9ba0f9ed76b2eb05db6c4e. 12/03/05 13:01:41 INFO regionserver.HRegionServer: Received request to open region: usertable,user515290649,1330944849739.d23924dc9e9d5891f332c337977af83d. 12/03/05 13:01:41 INFO regionserver.HRegionServer: Received request to open region: usertable,user63650623,1330944849739.a3b9f64e6abee00a2f39c33efa7ae8a2. 12/03/05 13:01:41 INFO regionserver.HRegionServer: Received request to open region: usertable,user757669512,1330944850808.cd0d6f16d8ae9cf0c9277f5d6c6c6b9f. 12/03/05 13:01:41 INFO regionserver.HRegionServer: Received request to open region: usertable,user878854551,1330944850808.9b8667b6d3c0baaaea491527cd781357. You can see how the regions are opened one after the other, but what you also might notice is that the number of active connections never climbs to 22 - it barely even reaches 10. Why is that? To understand this better, we have to see how files in HDFS map to the server-side DataXceiver's instance - and the actual threads they represent. The aforementioned DFSInputStream and DFSOutputStream are really facades around the usual stream concepts. They wrap the client-server communication into these standard Java interfaces, while internally routing the traffic to a selected DataNode - which is the one that holds a copy of the current block. It has the liberty to open and close these connection as needed. As a client reads a file in HDFS, the client library classes switch transparently from block to block, and therefore from DataNode to DataNode, so it has to open and close connections as needed. These are the only DataXceiver entries (in this example), so the count in the thread group is a bit misleading. Recall that the DataXceiverServer daemon thread already accounts for one extra entry, which combined with the two above accounts for the three active connections - which in fact means three active threads. The reason the log states four instead, is that it logs the count from an active thread that is about to finish. So, shortly after the count of four is logged, it is actually one less, i.e. three and hence matching our head count of active threads. This gives you two things. First, the summary states that there is one open file block at the time the command ran - matching the count reported by the "-openforwrite" option above. Secondly, the list of blocks next to each file lets you match the thread name to the file that contains the block being accessed. In this example the block with the ID "blk_5532741233443227208_4201" is sent from the server to the client, here a RegionServer. This block belongs to the HBase .META. table, as shown by the output of the Hadoop fsck command. The combination of JStack and fsck can serve as a poor mans replacement for lsof (a tool on the Linux command line to "list open files"). The JStack also reports that there is a DataXceiver thread, with an accompanying PacketResponder, for block ID "blk_-2005512129579433420_4199", but this ID is missing from the list of blocks reported by fsck. This is because the block is not yet finished and therefore not available to readers. In other words, Hadoop fsck only reports on complete (or synced, for Hadoop version that support this feature) blocks. We can verify this using the HBase JRuby shell. For this exercise we should stop HBase, which will close out all open files, remove all active DataXceiver threads from the JStack output, and reduce the number of active connections as reported by the DataNode's debug logs to one - the server thread, as you know by now. It means we have created an output stream to a file in HDFS. So far this file only appears in the HDFS ls command, but not in the JStack threads, nor in the logs as an increased active connections count. Note: The logging level of HBase is set to DEBUG, which causes for the above log statements to be printed on the console. The interesting part about the log statements is that they are printed before the thread is started, and before it is ended, meaning it will show one less, and one too many respectively. Also recall, that while the block is written to, it is accounted for in the Hadoop fsck's "-blocks" or "-openforwrite". The number of active connections reaches the elusive 22 now. Note that this count already includes the server thread, so we are still a little short of what we could consider the theoretical maximum - based on the number of files HBase has to handle. So, how many "xcievers (sic)" do you need? Given you only use HBase, you could simply monitor the above "storefiles" metric (which you get also through Ganglia or JMX) and add a few percent for intermediate and write-ahead log files. This should work for systems in motion. However, if you were to determine that number on an idle, fully compacted system and assume it is the maximum, you might find this number being too low once you start adding more store files during regular memstore flushes, i.e. as soon as you start to add data to the HBase tables. Or if you also use MapReduce on that same cluster, Flume log aggregation, and so on. You will need to account for those extra files, and, more importantly, open blocks for reading and writing. This formula takes into account that you need about two threads for an active writer and another for an active reader. This is then summed up and divided by the number of DataNodes, since you have to specify the "dfs.datanode.max.xcievers" per DataNode. 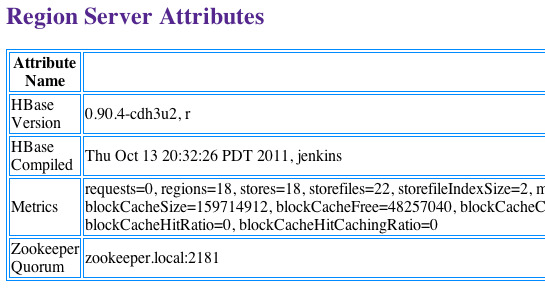 If you loop back to the HBase RegionServer screenshot above, you saw that there were 22 store files. These are immutable and will only be read, or in other words occupy one thread only. For all memstores that are flushed to disk you need two threads - but only until they are fully written. The files are finalized and closed for good, cleaning up any thread in the process. So these come and go based on your flush frequency. Same goes for compactions, they will read N files and write them into a single new one, then finalize the new file. As for the write-ahead logs, these will occupy a thread once you have started to add data to any table. There is a log file per server, meaning that you can only have twice as many active threads for these files as you have RegionServers. Obviously, the number of store files will increase over time, and the number of regions typically as well. Same for the numbers of servers, so keep in mind to adjust this number over time. In practice, you can add a buffer of, for example, 20%, as shown in the formula below - in an attempt to not force you to change the value too often. Finally, the engineering devil on one of your shoulders should already have started to snicker about how horribly non-Erlang-y this is, and how you should use an event driven approach, possibly using Akka with Scala - if you want to stay within the JVM world. Bear in mind though that the clever developers in the community share the same thoughts and have already started to discuss various approaches. https://issues.apache.org/jira/browse/HDFS-1861 "Rename dfs.datanode.max.xcievers and bump its default value"
 https://issues.apache.org/jira/browse/HDFS-1866 "Document dfs.datanode.max.transfer.threads in hdfs-default.xml"
 https://issues.apache.org/jira/browse/HDFS-200 "In HDFS, sync() not yet guarantees data available to the new readers"
 http://search-hadoop.com/m/CBBoV3z24H1 "HBase, mail # user - region size/count per regionserver"
 https://issues.apache.org/jira/browse/HDFS-223 "Asynchronous IO Handling in Hadoop and HDFS"
 https://issues.apache.org/jira/browse/HDFS-918 "Use single Selector and small thread pool to replace many instances of BlockSender for reads"
As more and more companies discover the power of Hadoop and how it solves complex analytical problems it seems that there is a growing interest to quickly prototype new solutions - possibly on short lived or "throw away" cluster setups. Amazon's EC2 provides an ideal platform for such prototyping and there are a lot of great resources on how this can be done. I would like to mention "Tracking Trends with Hadoop and Hive on EC2" on the Cloudera Blog by Pete Skomoroch and "Running Hadoop MapReduce on Amazon EC2 and Amazon S3" by Tom White. They give you full examples of how to process data stored on S3 using EC2 servers. Overall there seems to be a common need to quickly get insight into what a Hadoop and Hive based cluster can add in terms of business value. In this post I would like to take a step back though from the above full featured examples and show how you can use Amazon's services to set up an Hadoop cluster with the focus on the more "nitty gritty" details that are more difficult to find answers for. Let's jump into it head first and solve the problem of actually launching a cluster. You have heard that Hadoop is shipped with EC2 support, but how do you actually start up a Hadoop cluster on EC2? You do have a couple of choices and as Tom's article above explains you could start all instances in the cluster by hand. But why would you want to do that if there are scripts available that do all the work for you? And to complicate matters, how do you select the AMI (the Amazon Machine Image) that has the Hadoop version you need or want? Does it have Hive installed for your subsequent analysis of the collected data? Just running a check to count the available public Hadoop images returns 41! By far one of the most popular way to install Hadoop today is using Cloudera's Distribution for Hadoop - also known as CDH. It packs all the tools you usually need into easy to install packages and pre-configures everything for typical workloads. Sweet! And since it also offers each "HStack" tool as a separate installable package you can decide what you need and install additional applications just as you need. We will make use of that feature below and also of other advanced configuration options. Hadoop EC2 Scripts Apache Hadoop Bash Yes Requires special Hadoop AMIs. CDH Cloud Scripts Cloudera Python No Fixed to use CDH packages. Whirr Apache Whirr Python No Not yet on same level feature wise compared to CDH Cloud Scripts. Can run plain Apache Hadoop images as well as CDH. Supports multiple cloud vendors. They are ordered by their availability date, so the first available was the Bash based "Hadoop EC2 Scripts" contribution packages. It is part of the Apache Hadoop tarball and can start selected AMIs with Hadoop preinstalled on them. While you may be able to customize the init script to install additional packages you are bound to whatever version of Hadoop the AMI provides. This limitation is overcome with the CDH Cloud Scripts and Apache Whirr, which is the successor to the CDH scripts. All three EC2 script packages were created by Cloudera's own Tom White, so you may notice similarities between them. In general you could say that each extends on the former while applying what has been learned during their usage in the real world. Also, Python has the advantage to run on Windows, Unix or Linux, because the Bash scripts are not a good fit for "some of these" (*cough*), but that seems obvious. For the remainder of this post we will focus on the CDH Cloud Scripts as they are the current status quo when it comes to starting Hadoop on EC2 clusters. But please keep an eye on Whirr as it will supersede the CDH Cloud Scripts sooner or later - and added to the CDH releases subsequently (it is in CDH3B3 now!). work their magic to get the user data (which is one part of the "Instance Data") and optionally decompress it before executing the script handed in. The only other requirement is that the AMI must have Java installed as well. As we look into further pieces of the puzzle we will get back to this init script. For now let it suffice to say that it does the bootstrapping of our instances and installs whatever we need dynamically during the start of the cluster. Note: I am using the Ubuntu AMIs for all examples and code snippets in this post. All you have to do now is switch the symbolic link to run either cluster setup. Obviously another option would be to use the command line options which hadoop-ec2 offers. Execute $ hadoop-ec2 launch-cluster --help to see what is available. You can override the values from the current clusters.cfg or even select a completely different configuration directory. Personally I like the symlink approach as this allows me to keep the settings for each cluster instance together in a separate configuration file - but a usual, the choice is yours. You could also save each hadoop-ec2 call in a small Bash script along with all command line options in it. Back to the .hadoop-cloud directory above. There is another file hadoop-ec2-init-remote-cdh2.sh (see below) and a directory called lars-test-cluster, which is created and maintained by the CDH Cloud Scripts. It contains a local hadoop-site.xml with your current AWS credentials (assuming you have them set in your .profile as per the documentation) that you can use to access S3 from your local Hadoop scripts. to use the newer CDH3, currently in beta. Also note that the AMIs are currently only available in the us-east-x zones and not in any of the others. cloud_provider --cloud-provider The cloud provider, e.g. 'ec2' for Amazon EC2. auto_shutdown --auto-shutdown The time in minutes after launch when an instance will be automatically shut down. image_id --image-id The ID of the image to launch. instance_type -t | --instance-type The type of instance to be launched. One of m1.small, m1.large, m1.xlarge, c1.medium, or c1.xlarge. availability_zone -z | --availability-zone The availability zone to run the instances in. private_key Used with update-slaves-file command. The file is copied to all EC2 servers. ssh_options --ssh-options SSH options to use. user_data_file -f | --user-data-file The URL of the file containing user data to be made available to instances. user_packages -p | --user-packages A space-separated list of packages to install on instances on start up. Note: Since I am running Ubuntu AMIs I used the SKIP_RPM=1 flag to skip RedHat package generation. Copy the final .deb file to a save location naming it hadoop-lzo_i368.deb or hadoop-lzo_amd64.deb using scp for example. Obviously do the same for the yum packages if you are preferring the Fedora AMIs. Note that we cannot use ~/.hadoop-cloud/... as the filename because the Python code does not resolve the Bash file path syntax. echo "do it yum style..."
Sep 14 12:10:56 ip-10-242-18-80 user-data: Selecting previously deselected package toddlipcon-hadoop-lzo. Note: A quick tip in case you edit the init script yourself and are going to add configuration data that is output to a file using cat (see cat > /tmp/.s3cfg << EOF above): make sure that the final "EOF" has NO trailing whitespaces or the script fails miserably. I had "EOF " (note the trailing space) as opposed to "EOF" and it took me a while to find that! The script would fail to run with an "unexpected end of file" error. A comment on EMR (or Elastic MapReduce), Amazon's latest offering in regards to Hadoop support. It is a wrapper around launching a cluster on your behalf and executing MapReduce jobs or Hive queries etc. While this will help many to be up and running with "cloud based" MapReduce work it has also a few drawbacks: for starters you have to work with what you are given in regards to Hadoop versioning. You have to rely on Amazon to keep it current and any "special" version you would like to try may not work at all. Furthermore you have no option to install LZO as described above, i.e. the whole bootstrap process is automated and not accessible to you for modifications. And finally, you pay for it on top of the standard EC2 rates, so it comes at a premium. s3cmd s3 Supports access to S3 as provided by the AWS API's and also the S3 Management Console over the web. hadoop s3, s3n Supports raw or direct S3 access as well as a specialized Hadoop filesystem on S3. You may now ask yourself which one to use. If you will never deal with very large files it may not matter. But if you do, then you need to decide if you use Hadoop's binary filesystem or chop files yourself to fit into 5GB. Also keep in mind that once you upload files using Hadoop's binary filesystem then you can NOT go back to the native tools as the files stored in your S3 bucket are named (seemingly) randomly and content is spread across many of those smaller files as can be seen in the example above. There is no direct way to parse these files yourself outside of Hadoop. One final note on S3 and provisioning data: it seems it makes more sense to copy data from S3 into HDFS before running a job not just because of the improved IO performance (keyword here: data locality!) but also in regards to stability. I have seen jobs fail that read directly from S3 but succeeded happily when reading from HDFS. And copying data from S3 to EC2 is free, so you may want to try your luck with either option and see what is best for your use-case. This is particularly interesting as we can use Oozie to spin up our EC2 clusters as well as run the ETL job (which could be a Kettle job for example), followed by the Hive queries. Add Sqoop and you have a tool to read and write from legacy database in the process. But as I said, I leave this whole topic for a follow up post. But I do believe this is important to understand and document the full process of running Hadoop in the "cloud". Only then you have the framework to run the full business process on Amazons Web Services (or any other cloud computing provider). With Whirr being released it seems like the above may become somewhat obsolete soon. I will look into Whirr more and update the post to show you how the same is achieved. My preliminary investigation shows though that you have the same issues - or say "advanced challenges" to be fair as Whirr is not at fault here. Maybe one day we have an Apache licensed alternative to LZO available and installing a suitable compression codec will be much easier. For now this is not the case. Another topic we have not touched upon is local storage in EC2. Usually you have an attached volume that is destroyed once the instance is shut down. To get around this restriction you can create Snapshots and mount them as Elastic Block Storage (or EBS) which are persisted across server restarts. They are also supposedly faster than the default volume. This is yet another interesting topic I am planning to post about as especially write performance in EC2 is really, really bad - and that may affect the above ETL process in unsuspected ways. But on the other hand you get persistency and being able to start and stop a cluster while retaining the data it had stored. The CDH Cloud Scripts have full support for EBS while Whirr is said to not have that working yet (although WHIRR-3 seems to say it is implemented). Let me know if you are interested in a particular topic regarding this post and which I may not have touched upon. I am curious to hear what you are doing with Hadoop on EC2, so please drop me a note.